Birmingham Public Schools commissioned Counsilman-Hunsaker, in association with TMP Associates, to upgrade Seaholm High School’s indoor physical education and athletic facilities. The pool was in dire need of major renovation for several reasons: the functional condition was obsolete, appealing amenities were not in place, and the design limited program opportunities. Renovation included building a new three-court gymnasium as well as designing a new swimming pool. 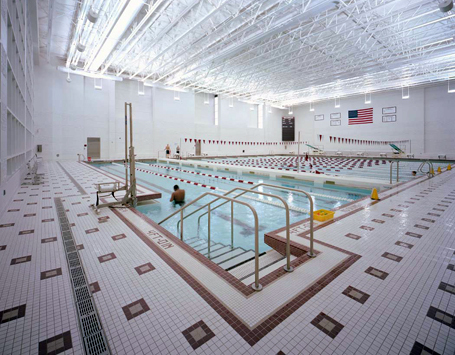 Responsible for aquatic design, Counsilman-Hunsaker created a functional, attractive facility with numerous amenities. The new eight lane stretch 25-yard pool includes a moveable bulkhead, offering versatility to accommodate simultaneous aquatic lessons, fitness, and activities. The beautiful new climate-controlled natatorium offers a light-filled swimming experience with state-of-the-art mezzanine-style seating for fans’ viewing pleasure.